Two iconic locations are the featured destinations on a seven-day/six-night bus tour to California sponsored by the Friends of SaddleBrooke Libraries. The tour will be on March 20-26, 2019. First up are two nights in Palm Springs, the legendary home of Hollywood movie stars. The adventure begins on the Aerial Tramway up Mount San Jacinto and dining in the Peaks Restaurant. The Palm Mountain Resort in the heart of Palm Springs will provide easy access to all of the towns amenities. The second day will begin on a tour of Palm Springs and the Coachella Valley with a local guide narrating the history and culture of the region. The tour will include everything from midcentury modern architecture to wind energy generation and a rest stop at a date farm. 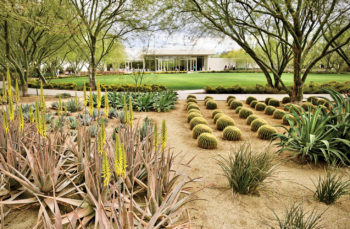 After lunch the tour will visit the gardens at Sunnylands, the former home of Ambassadors Leonor and Walter Annenberg who hosted many Presidential summit meetings. The day will conclude with time to enjoy the Palm Springs VillageFest with over 200 booths offering art, handcrafted items and unique food. Day three will be a travel day from Palm Springs to Death Valley. Stops in Joshua Tree National Park and the Mojave Desert Preserve will provide an opportunity to learn about the characteristic flora and fauna of the Mojave Desert. While Death Valley is the lowest and hottest place in America, March is the perfect time to be there. Temperatures are comparatively mild with an average high of 82 degrees and low of 55 degrees. If conditions are right, there may be a spectacular wildflower display. The accommodation in Death Valley is The Ranch in Furnace Creek. Each room has a patio opening on to a grass lawn and easy access to the spring-fed swimming pool. The Ranch includes the brand-new Town Square with a restaurant, shops and The Last Kind Word Saloon. On the first day in Death Valley an expert on the valley’s history and geology will lead a tour of the upper valley. Stops will include Ubehebe Crater, Devil’s Cornfield, Mesquite Sand Dunes and Salt Creek. Lunch will be at the Badwater Saloon in historic Stovepipe Wells. The second day in Death Valley will feature a tour of the area around Furnace Creek in the morning including Badwater, Devil’s Golf Course and Zabriskie Point. The afternoon will be free time to enjoy the facilities at The Ranch. Or choose from optional activities such as a jeep tour to Death Valley’s back country, a hike into Golden Canyon and photography instruction with James Cowlin. The tour will conclude with a special dinner at The Inn at Death Valley’s four-diamond restaurant. The last night of the tour will be at the Golden Nugget in Laughlin. The day will start with a tour of the Amargosa Opera House followed by lunch at the Pioneer Saloon in Goodsprings. The day will end with a dinner cruise on the Colorado River. The journey to SaddleBrooke will be celebrated with a final luncheon at Rancho de los Caballeros in Wickenburg. Those who want to register for the trip should visit the FSL website, sbfsl.org, to download a registration form and trip itinerary.